Monopoly is back at McDonald’s! 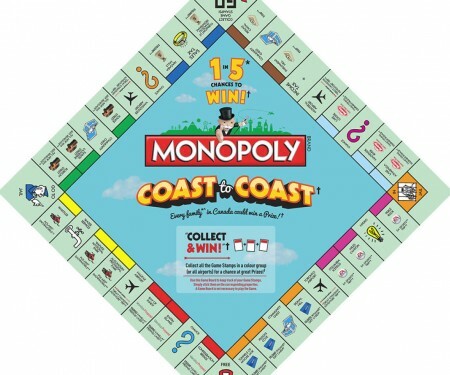 The Monopoly Coast to Coast game is available in now until November 16, 2015. There’s a 1 in 5 chance to win win and over 14 million prizes available to be won in total. The official McDonald’s Monopoly game board can be downloaded online here or you can pick one up at your local McDonald’s restaurant. A special Canada-only Monopoly Coast to Coast Game is here with 1-in-5 chances of winning – every family in Canada could win a Prize! From the Bay of Fundy, to Peggys Cove, all the way to the Tunnels of Moose Jaw and Stanley Park, collect the Game Stamps for Canada’s wonderful landmarks. For your 1 in 5 chance at over 14 million Prizes. Click here to visit McDonald’s Monopoly website for more details. Click here to download McDonald’s Monopoly Game Board.